Ohio State trailed by eight points with 51 seconds remaining. The third-ranked Buckeyes were assured their first loss. Head coach Thad Matta spent the second half purple-faced screaming at his team after several defensive breakdowns and an offensive display that left him dismayed. But unforeseen outcomes are part of Madison Square Garden’s luster. And what Ohio State – and Notre Dame – did Saturday night will add to the lore of the world's most famous arena. The Buckeyes made fewer than 10 field goals in the second half until they found that magic elixir that eluded them. Just as fans started exiting for Times Square, the Fighting Irish turned the ball over three times and Ohio State ended the game on a 14-3 run, reversing an eight-point deficit to win 64-61. Lenzelle Smith Jr., the Buckeyes’ leading scorer through 11 games, was held to zero points before erupting for nine in the final minute, including the go-ahead basket with 16 seconds left. Trailing 58-50, Ohio State scored six straight points, using a suffocating full-court press that overwhelmed the Notre Dame. Those six points came in a blitzkrieg – less than six seconds. The Irish reestablished a two-possession lead with two free throws before Smith was fouled shooting a 3 and made each free throw to bring the Buckeyes within one with 33 seconds remaining. The good fortune would continue for Ohio State after freshman Steve Vasturia, attempting his first career free throw, missed badly on the front end of a one-and-one. Aaron Craft drove the length of the field and dished off to Smith who made a layup to put the Buckeyes in front by one with 17 seconds left. It would grow to three after Notre Dame turned the ball over and Smith made two free throws. 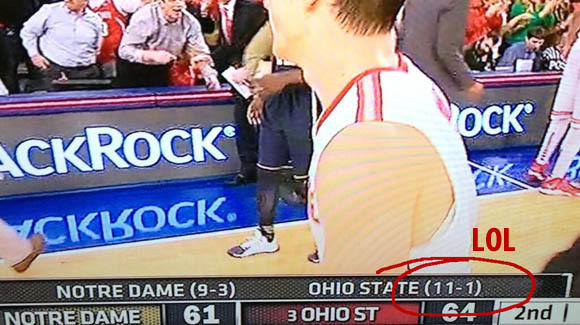 With a three-point lead, Ohio State opted to foul the Irish. It made one free throw leading to Craft being at the line. He made both attempts, and Notre Dame missed a possible tying three-pointer at the buzzer. LaQuinton Ross finished with 16 point sand 11 rebounds, Amir Williams had 13 points and Shannon Scott and Craft added 10 points apiece. The Buckeyes shot a robust 50 percent from the field in the first half. Despite their improbable comeback, they only made 10 of 29 shots in the second half, including zero 3s. Ohio State went more than nine minutes without a field goal midway through the second half. A 33-26 halftime lead quickly evaporated when the Irish scored nine of the first 11 points after the break. Until the final seconds, the Buckeyes’ last lead was at 11:06 of the second half.